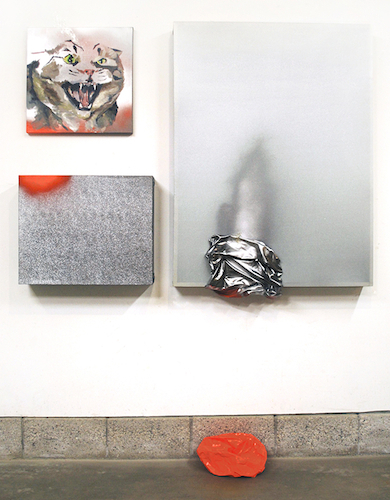 Kelly O’Brien, Metallic Aggression, 2014, spandex, duct tape, latex, glitter, spray, oil paint, 65 x 81 x 7". While Kelly O’Brien aims to achieve a frisson by integrating oil portraits of cats with minimalist sculpture in her show “Kulture High,” the exhibition’s real pleasure comes less from that unexpected pairing than from O’Brien’s exuberant use of her materials and her confident sense of design. With fifteen recently made pieces comprising this installation that occupies a single long gallery of the newly relocated Soo Visual Arts Center, the Minneapolis-based artist’s primary palette here involves shades you might find in a pack of highlighters: bright yellow, pink, and orange. The traditional rectangular canvas is a theme on which O’Brien works wild variations, incorporating multimedia sculptural elements such as balls of aluminum tape and duct tape. In See-Through Bulge, 2014, for instance, an orange-and-green tape ball is trapped behind a nylon screen stretched over a wooden frame. In Metallic Aggression, 2014, silver spandex is stretched over a tall frame while another clump of metallic fabric seems to be worming its way out. In Hierarchical Stereotypes, 2015, an unseen material bulges ominously from inside a frame wrapped in yellow spandex. In every piece, cats are either seen—often painted scowling or yowling on their own canvases—or suggested, as in the pieces accompanied by lumps of brightly painted duct tape fashioned in about the same size and shape as a house cat on its haunches. The cats’ unheeded indignation might mirror that of any gallerygoer who would think to judge the artist for having such shameless fun.